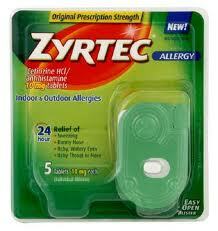 Beginning Sunday at CVS, you can get the 5 ct Zyrtec for FREE + moneymaker with this $2/1 Zyrtec printable coupon . Final Price: FREE + $2 moneymaker! Find more freebies and coupon matchups at CVS starting Sunday.